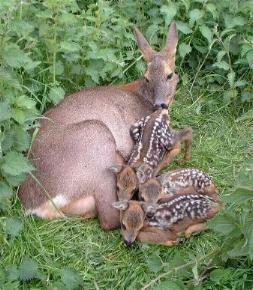 Reproduction in female European roe deer has been a bit of a mystery for over 200 years. She has not given up her secrets easily. 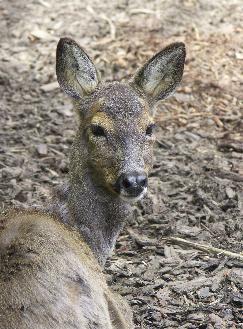 The roe deer has the reproductive strategy of embryonic diapause (delayed implantation), the rut takes place in late July or early August and she gives birth the following late May or early June. Between the time of the rut and late December the embryo remains at about the 30-cell stage and is in a state of diapause. The embryo (biologically known as a blastocyst at this developmental stage) is tiny, less than 1mm in diameter, during the period of embryonic diapause. In late December or early January the blastocyst reactivates, grows rapidly and forms a placental attachment to the mother and normal fetal growth follows. What no one knew was what triggered the embryo to reactivate, as roe does do not have any of the usual hormonal signals associated with the end of the period of embryonic diapause found in other mammals. By using the latest scientific techniques (similar to DNA sequencing) the Department of Zoology at the University of Aberdeen, has solved the puzzle. The blastocyst sends out a 'signal' to its mother with a protein called PAG (Pregnancy Associated Glycoprotein) unique to the roe deer; i.e. 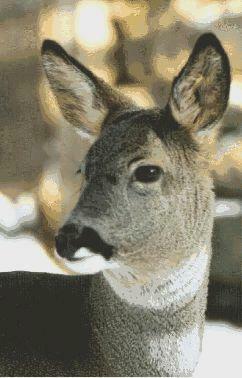 the genetic profile of the roe deer PAG is very different from PAGs found in other similar species. To be more technical, PAGs were first discovered in cows and sheep in the 1990's and their properties show that they belong to the aspartic proteinase gene family, are highly polymorphous (genetically very adaptable and constantly changing their DNA profile), are released from trophoblast cells (these are a thin layer of cells which surround the blastocyst and eventually form the placenta) and bind to specific cell surface receptors on maternal target cells on the endometrium in the uterus. The role for PAGs in trophoblast cells had not previously been defined, basically no one knew what they were for, because in other species, recognition that she is pregnant is the result of the mother sending out an hormonal signal (usually progesterone) and the embryo replying, again with a hormonal signal. In roe deer the doe does not send out a maternal signal to say 'that's delayed implantation over, time you (the embryo) woke up' which is why it has been so hard to find out what actually happens. Our study demonstrates that embryonic programming (the embryo has a built in 'clock') initiates the transcription of specific genes in the inner cell mass of the embryo (these are the cells which will eventually form the deer). These specific genes send out messenger RNA and this directs synthesis of rdPAG in the trophoblast. The roe deer specific PAG is released from the trophoblast and it triggers the maternal response by targeting endometrial (uterine) receptors. As soon as the doe has received this message from the blastocyst a whole 'cascade' effect is triggered of maternal hormones (oestrogens), which starts off the second phase of her pregnancy. The embryo rapidly elongates and then forms a placental attachment to the endometrium and normal fetal growth follows for the next five months. A puzzle resolved and as always the European roe deer does it differently than any other mammal. It is indeed a unique animal. Biology Department, University of Minho, Portugal 23rd April – 26th April 2003. Embryonic Diapause in Roe Deer: The physiology and endocrinology of the pregnant roe deer between the period of late embryonic diapause and early fetal growth. RT Lambert, CJ Ashworth, L Beattie, FE Gebbie, JSM Hutchinson, DJ Kyle andPA Racey. Abstract published 1998, Journal of Reproduction and Fertility, 22: 33. Lambert, Roger, 1999 The 4th International Biology of Deer Congress (Oral Paper: Temporal changes in reproductive hormones and conceptus-endometrial interactions during delayed implantation in European roe deer (Capreolus capreolus).